The Tohono O’odham Nation tribe in Arizona says they won’t support Donald Trump’s border wall. The Tohono O’odham tribal land covers the Mexican border for 75 miles. The tribal leader told reporters, “Over my dead body!” will a wall be built on tribal land. It looks like Donald Trump will have to wall in the reservation. 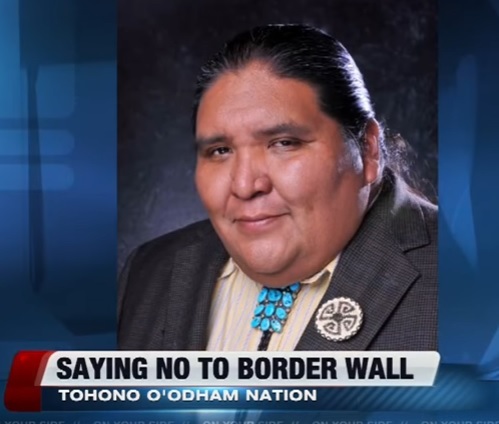 Tribal leadership of Tohono O’odham Nation in southern Arizona said they won’t support a border wall project on their land. Part of their reservation extends into Mexico and covers 75 miles of the international border. The tribe’s chairman and vice chair said the plan was always to try to work with whoever holds the office of the United States President. But, they added, it’s still too early to tell exactly how Donald Trump’s administration will impact the tribe. Vice Chairman Verlon Jose explained tribal members have traversed their ancestral land since time immemorial, and a wall of any sort would not be supported by the community.